It’s January and the mad rush of the holidays is over, so take a deep breath, sit back, and relax. But no – wait – you just realized that you over spent during the holidays and now you need to look for ways to cut costs! Don’t worry we can help you out. You won’t look farther than inside your home. One of the biggest expenses in your home comes from your heating and cooling system, and a close second is your water heater. If you have older, inefficient equipment, one of the best ways to lower your costs for years to come is to install newer, energy efficient systems. In addition to big savings on your utility bills, a new system will also eliminate the need for expensive repairs and escalating maintenance costs associated with an aging system. 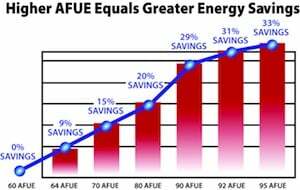 In the graph below, you can see how much money you can save by upgrading your old heating equipment to a new higher efficiency system. The greater the gain in efficiency from a new furnace means the greater the energy savings to you. Water heating is the second largest energy user in your home. According to the Department of Energy, water heating can account for as much as 14-25 percent of your total home energy use. Replacing an older unit with a high-efficiency one is another way to make a big impact on your monthly utility bills. Many homeowners are considering tankless water heaters, instead of traditional storage tanks, as an option to reduce costs. According to research, most homes use hot water for a cumulative total of about one hour per day, yet they typically keep 40 or 50 gallons (oftentimes more) of water hot 24 hours a day. Having a system that eliminates the storage and heats water only as you use it can dramatically reduce your energy consumption. Tankless water heaters (also called instant water heaters) eliminate this water storage need, as they instantly heat water only when you need it. On average, tankless water heaters are 30% more energy efficient than traditional tank water heaters and they can reduce water heating costs by up to 50% in most households. Lastly, all equipment has a life cycle, something you need to keep in mind. If you have an air conditioner over 8 years old, a furnace (or heat pump) over 10 years old, or a traditional water heater over 7 years old, replacement may be a consideration not only for the energy savings, due to improved technology, but also due to the increasing repair and maintenance costs associated with older equipment. Don’t wait until your equipment becomes a never-ending money pit. Consult with your heating and coolingtechnician or plumberbefore you fix something that you’d be better off financially replacing. The holidays may be over but saving money is a year-round project. By using energy efficient heating, cooling and plumbing equipment you can save energy and money for years to come. You can find out more information about energy efficient equipment at the following website: www.energystar.gov and www.ajperri.com.